Quality Products...Top Performance...Intelligent Design... Sound Appeal. Premium quality components improve overall clarity and tonal response. Utilizing ½" MDF for the cabinet walls provides adequate stiffness and density preventing cabinet resonance while yielding excellent acoustical properties. The cabinet is cloaked in a quality wood grain veneer giving it distinction and elegance. A wall mounting hook to get your speakers up quick is included. There are pre-drilled pilot holes for attaching a swiveling wall or ceiling mount (not included). The grill design is part of the appeal. A tapered grill reveals the wood grain edges and extends the graceful curve on the front of the speaker, making it look as good as it sounds. The grill is removable; showcasing the high quality drivers and tuned port. Designed to impress: The appeal of these bookshelf speakers extends to appearance and performance. 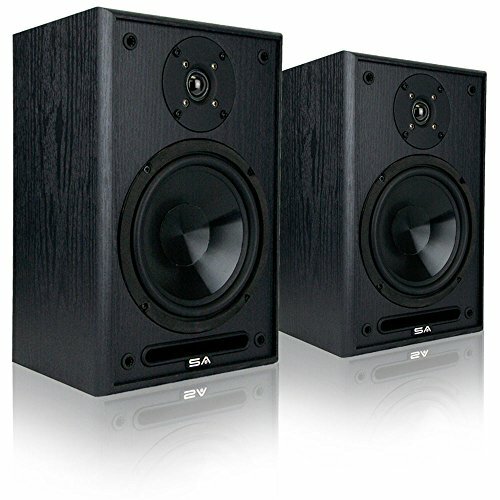 High-quality components coupled with black wood grain cabinets allow this stunning speaker to compete with and outperform much more expensive speakers. Stands apart: These capable, audiophile grade speakers will not break your budget but will exceed your expectations. Refined silk dome tweeters, 6.5" Polypropylene Woofers and a custom tuned bass reflex port accomplish fantastic sound in an unparalleled, affordable package. Dimensions: Cabinet measures 12" (H) x 7.75" (W) x 7.5" (D). Can be wall mounted with the included eye hook and is also pre-drilled to accept the Aeon speaker mount. Search Amazon for ASIN: B005SEN20S. Specs: Impedance: 8 Ohms. Power Handling: 80 Watts RMS. Frequency Response: 45Hz to 22kHz. Warranty: Three year parts and labor (limited) warranty. Sound Appeal guarantees this product will be free from defects in workmanship and materials. If you have any questions about this product by Sound Appeal, contact us by completing and submitting the form below. If you are looking for a specif part number, please include it with your message.